Add value to your home: If you decide to put your home on the market one day, the additional square footage will ratchet up your selling price. Less expensive than moving: The cost of moving to a larger home is usually more costly than paying for an addition. Enjoy your space more: Form enhances function! If it’s your kitchen that you’d like to expand and enhance, just imagine how much more you’ll enjoy preparing meals in a space of your own making. Celebrate stability: Particularly if you have children, you will find that, rather than moving, opting for an addition can help your family avoid the discomfort of uprooting, not only to a new home but also to a new neighborhood and/or school district. Less wait time: An addition requires less time than selling your old home and buying a new one. Make it your own: Jettison the “builder basic” nature of your home, or the personality of its previous owners, and fashion it according to your needs and tastes. Stop dreaming about your sunroom addition and start making it happen. Call Windows Unlimited at 705.673.1115! Are you running out of space? Or do you find that you just can’t rearrange your furniture enough times to get your space to flow right? Instead of moving, hire the professional team at Windows Unlimited to add a sunroom. We find that an addition is at the top of many Northern Ontario area homeowners’ wish lists. Nevertheless, so many of our customers are surprised to hear just how within reach an addition can be. 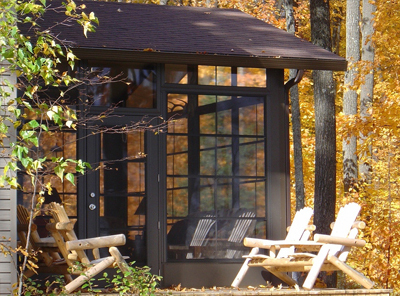 Without sacrificing quality, we keep our sunrooms as affordable as possible. We will work closely with your architect to create a space that makes your home sweet home especially sweet.